Located at the east end of the Puente Cabrillo, the California State Building was the centerpiece of the Panama-California Exposition. Consulting and Advisory Architect, Bertram Grosvenor Goodhue, designed the reinforced concrete structure to resemble a Spanish-Colonial cathedral, such as those found in major cities of Mexico. 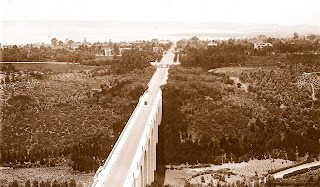 To soften the abruptness of its proportions, when viewed from the Puente Cabrillo, a smaller structure was built at the California State Building's west side. This building was known as the Administration Building, and housed the administrative offices of the exposition. Adjacent to the Administration Building was the ceremonial entrance gateway to the exposition, consisting of a broad archway spanning El Prado, flanked by Doric columns. 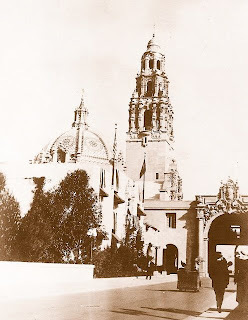 At the top of the archway was located a large sculptural panel containing the coat of arms of the City of San Diego, and the year 1915. Below the panel, in the spandrels of the arch, were placed male and female figures symbolizing the Atlantic and Pacific oceans, joining the waters together to commemorate the opening of the Panama Canal. 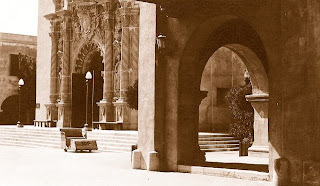 After passing through the arch, the Plaza de California was entered, with the massive Churrigueresque California State Building on the left, and the smaller Mission-style Fine Arts Building on the right. 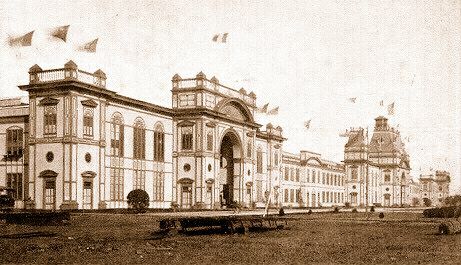 Together these two inter-connected buildings were known as the California Quadrangle, and comprised the largest permanent group of buildings constructed for the exposition. The California State Building was comprised of a central structure, containing a massive dome covered in polychrome tiles of blue, green, yellow, black, and white, with an ornate lantern at its top; and a 200-foot triple-storied belfry tower, topped with a tile dome and a wrought-iron weathervane in the form of a Spanish ship. 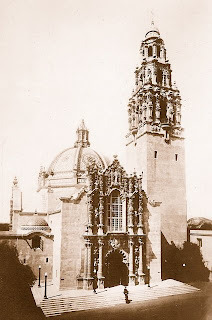 The grand entrance to the building faced the Plaza de California, and consisted of a frontispiece covered in sculpture representing eminent names connected with the history of San Diego. Fray Junipero Serra, founder of the chain of California Missions, was located prominently at the top, flanked by busts of Charles the Fifth and Philip the Second, of Spain. Beneath these busts, on either side of a massive Moorish-style window, were placed statues of Spanish explorer Juan Rodriguez Cabrillo, and Spanish navigator Sebastian Vizcaino. Below these two statues were busts of English navigator George Vancouver, and Gaspar de Portola, first Spanish Governor of California. 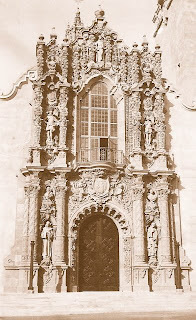 Flanking the large arched entrance doors, at the bottom of the frontispiece, were located statues of Fray Luis Jayme, first Christian martyr of the California Mission period; and Fray Antonio de la Ascension, the Carmelite historiographer who accompanied Sebastian Vizcaino to California. 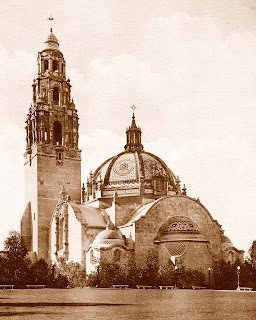 On the east and west sides of the building were placed large windows, surrounded by massive cast-stone Churrigueresque frames, containing heraldic seals of the State of California, and the motto "Eureka"; while on the north side was placed an apse, with a colorfully tiled half-dome. At three corners of the structure were located small tile-domed pavilions; while at the south-east corner, facing the Plaza de California, was located the triple-tiered and tile-dome topped belfry tower. Fine views of the exposition and San Diego, the mountains, the bay, and the Pacific Ocean could be had from the ornately designed tower. Encircling the base of the California State Building's large central dome were tiled panels containing a Latin quotation from the Vulgate of St. Jerome, fitting to California, which translated as: "A land of wheat, and barley, and vines, and fig trees, and pomegranates; a land of oil olive, and honey". The east entrance to the California Quadrangle consisted of another broad archway, spanning El Prado, similar to the arch located at the west side of the building. This arch was topped with an ornate tiled panel, representing the coat of arms of the State of California; while the spandrels of the arch contained tile panels representing the Spanish government, dated 1769, and the American government, dated 1846. Within the building were located numerous archaeological displays from Central America, gathered by the Smithsonian Institution; as well as exhibits representing the State of California.